Easily bend blow and draw notes. 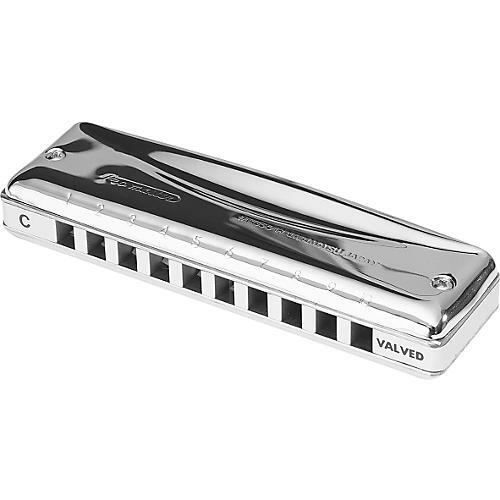 The Suzuki Promaster Valved Harmonica is a 10-hole diatonic built with the same precision as the standard Promaster. This revolutionary harmonica features precision crafted reed plates for easy note bending and phosphor bronze reeds. The draw cycle valve system circulates air to allow note bending in the blow as well as the draw cycle. Its note bending abilities will make your music magical! Comes with a soft lined hardshell carrying case. Valves-also known as windsavers-are typically used in chromatic harmonicas to prevent air from going into the reed that is not being played. For example, air from a blow reed does not escape through the slit for the draw reed. On a diatonic harmonica, valves make it more airtight and it becomes easier to bend the lower blow notes and upper draw notes by focusing more of the air to a single reed.